Between September and December 2016, Ludovic Balland set out to document how Americans were making sense of the campaigns and the constant hum of media coverage in the run up to and aftermath of the contentious general election. On his 13,000-mile road trip across the country, he called on twenty cities and attended major events, such as the inauguration and the Women’s March in Washington, DC. The result of this four-month road trip is American Readers at Home, which collects interviews with more than two hundred people living in cities and small towns across the United States. With print media struggling to survive in an age of twenty-four-hour real-time news and social media feeds, American Readers at Home presents a new, personalized model of story-telling in journalism that reaches audiences by emphasizing how everyday news items relate to personal experience and form people’s views. Throughout the trip, Ballard and his collaborators spoke with a wide variety of American citizens, reflecting the diversity of perspectives in the contemporary United States, including people of vastly different social, economic, and cultural backgrounds and both everyday citizens as well as politicians and celebrities. Through their statements and the expressive full-page color portraits featured in the book, we are encouraged to consider their perspectives—their hopes, fears, and expectations both before and after the election. 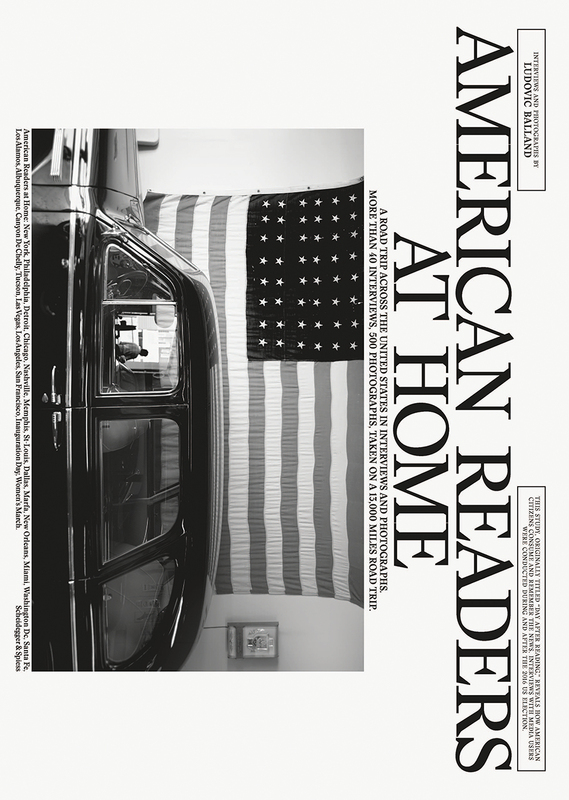 Filled with fascinating insights, American Readers at Home is the comprehensive archive of this fascinating media project originally published across multiple platforms, including the project’s website and social media channels, as well as local print and online newspapers and radio and television stations that distributed the interviews. It forms a highly original record of the United States at a time when at a time when the country was facing great uncertainty and change.